Alexander Del Rosa has been selling Men's and Women's sleepwear since the beginning of the internet age. I love to be comfortable when I sleep, but I also want to look feminine. It is comfy to wear boxer shorts and a long t-shirt, but is it attractive? Not really. Alexander Del Rosa has a line of Womens Cotton Nightgowns that I just love! Simple, white cotton, yet elegant! So comfortable to sleep in. Often I get caught up and tangled in nightgowns but this particular one was roomy and flowing enough I never once got tangled. Very comfortable, elegant and attractive! $34.99 is a great value for this beautiful nightgown. It reminded me of the pioneer days when they would wear their solid white dressing gowns. So simple and modest! I have washed it several times and have had no issues at all with it shrinking or wearing out. I love this nightgown! Perfect Mom nightgown! 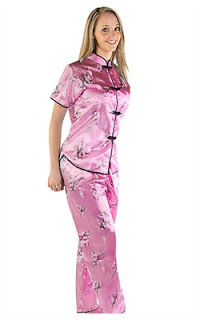 I thought these Traditional Chinese Pajamas were darling! What a great set that you can lounge around in while you drink your coffee in the morning. They also carry bath robes, sleep shorts, pajama pants and much more in sleepwear. Don't forget hubby, they carry bathrobes, pajama pants and loungewear for him as well. 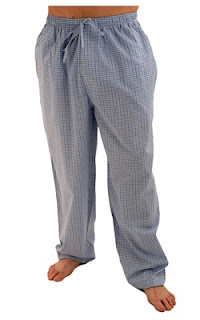 These Men's Cotton Pajama Pants are very reasonably priced at $14.95. I have wanted Footed Pajamas for a long time. These beauties are going on my Christmas wish list! Much higher quality than you can get at the local super center! Enter to win a $50 GC to purchase your pajamas to see just how great this company is!! Follow the rafflecopter for entries. USA only. Must be 18 to enter. I could use a new satin robe! Some lovely womens cotton pajamas! I would get a luscious robe for my gf. get my husband some pj pants.